NEW YORK—Hailing a wheelchair accessible taxi is like finding a needle in a haystack, but for New Yorkers whose only taxi option is using an accessible one, the search will soon be easier. With a court victory on June 6, the city was given the green light to add 2,000 wheelchair-accessible yellow cabs, as well as 3,600 accessible green cabs in the newly created outer borough fleet. The new allotment of yellow taxi medallions will give a much needed boost to the Accessible Dispatch program, which can currently only call on 233 taxis to pick up passengers, as well as allow users new access to the outer boroughs, which has been without accessible taxis. It will take three to five years before the accessible fleet reaches the newly allotted levels. In October, the city will hold its first auction of the new yellow cab medallions, although the Taxi and Limousine Commission (TLC) did not specify how many medallions would be available. Bill Scalzi, President of Accessible Dispatch, the program the city uses to dispatch the accessible taxis to customers, characterized the move as a home run for everyone. “We have been struggling because 233 taxi cabs is not nearly enough to provide the service we would like,” Scalzi said by phone June 6. He also said not all of the 233 taxis are out at one time. Of those on the road, Scalzi said they are not always available because they can pick up other passengers. Currently, the average wait time for an accessible taxi using the Accessible Dispatch program is 11 minutes, and Scalzi believes the added taxis will drop that to five minutes. Accessible Dispatch is only available for the yellow cabs, which operate in Manhattan, below 96th Street. The rule will stay in place, since the 18,000 taxis which will make up the outer borough fleet will not be allowed to originate rides within that area. In the green fleet, 3,600 must be accessible. New Yorkers requesting an accessible taxi in the outer boroughs could hail one, or call the car service the taxi belongs to, according to TLC spokesperson Allan Fromberg. The city will only offer 6,000 Outer Borough licenses per year, of which 1,200 must be wheelchair accessible. Fromberg said the TLC would not equally divide up the licenses between boroughs, but would make sure areas in high demand would have greater access. The TLC will only sell 4,800 non-accessible licenses, forcing the hand of some livery car owners to use an accessible taxi. A $15,000 city subsidy will be offered to make up the cost of retrofitting a taxi to make it accessible. Fromberg believes this will make the wheelchair license very popular, as it only costs $1,500 for three years. Wheelchair rights advocates have been pushing the city for years to make the taxi fleet more accessible to their needs, partly due to limited accessible subway stations. 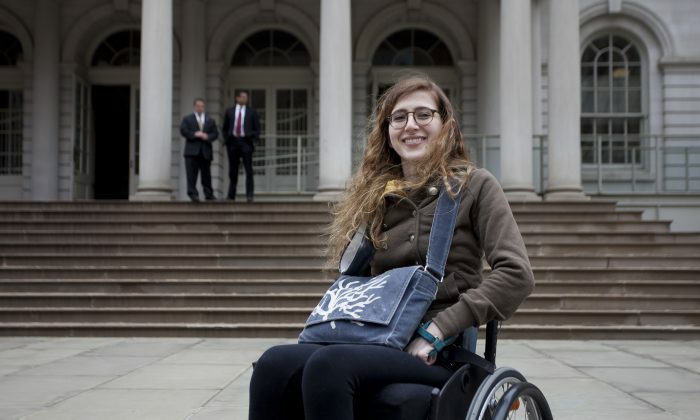 A bill in the City Council requiring all taxis be accessible in three years fizzled last month, leaving little hope for improving mobility for wheelchair users in the city. Thursday’s ruling changed that, and the city can begin to move in the direction of greater accessibility. Weisman, who lobbied for the state law in Albany, said the TLC will be required to create a plan for improved mobility, which must be approved by the State Department of Transportation Commissioner, in order to continue to sell medallions after a year. The announcement was good news for some, but for advocates who had hoped to see all taxis accessible, the announcement fell short. She did not think the outer borough plan would increase her odds of getting a taxi because she has to travel 10 blocks to find cabs in her neighborhood. Edith Prentiss, Chairwoman for Taxis for All Campaign, also championed for the bill to require all taxis be wheelchair-accessible. Prentiss said she was excited to hear the medallion owners could choose from taxis other than the Nissan NV200, also known as the Taxi of Tomorrow, which the city has chosen as the model for all new yellow taxis. Both Prentiss and Ryan have taken issue with the Taxi of Tomorrow, which is set to launch in October. New Yorkers in the outer boroughs looking to hail a taxicab will not have to wait much longer, outer borough taxi service will be here this summer.